Eric Sommer is an extraordinary guitar player. 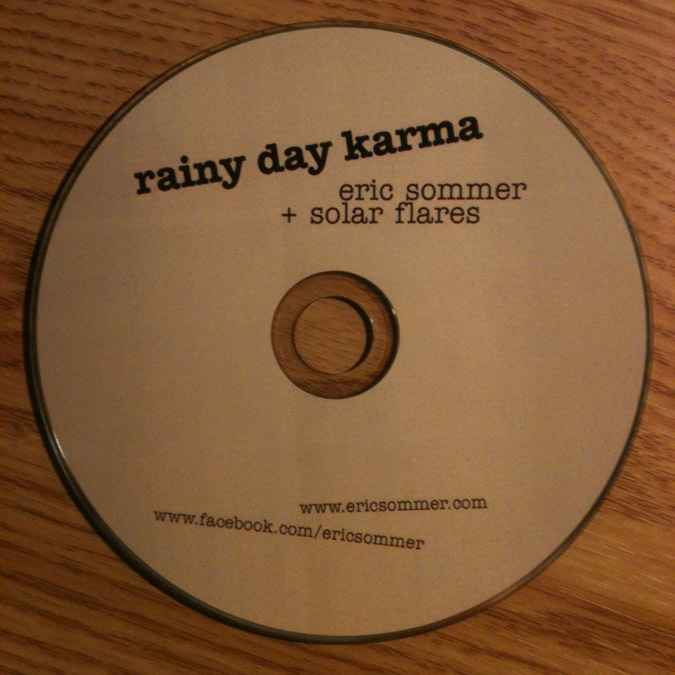 His album with the Solar Flares Rainy Day Karma is a supreme showcase of his talents with that instrument in his hands. The album is a bluesy collection of 10 songs that go beyond Sommer’s guitar skills to show he is actually a very good singer and song craftsman as well. Any album beginning with the cackle of a chicken immediately informs the listener it won’t be too much of a solemn affair. The genre bending starts right after the chicken finishes with the barnyard imagery of “Farmer Brown.” The album’s best track emerges after the story of Farmer Brown is told with the song “Cover My Soul.” “Cover My Soul” takes the images of cornfields away from the first song but the lyrics are much deeper for this tune. The album contains plenty of guitar picking at its finest, a couple times being an entire instrumental song with “Thunderstick” and “Bayou Ballet.” Though the songs contain bluesy guitar, the album is really a very upbeat record overall. The joyful lyrics of “You told me you loved me and that was good, I told everybody in the neighborhood” show this in the song “Tell Me What.” Even on “Harmony of the Meek” a song about dealing weapons in Afghanistan, Sommer keeps the music bouncy and upbeat leading to a strangely appealing mix. Stellar tracks like “I Caught A Cab” and “Cover My Soul” steal the show on the record. Rainy Day Karma is worth a listen just to hear the superior guitar playing but listeners will find they will be rewarded with hearing a very good songwriter as well. This entry was posted in 250 word album reviews and tagged 250 Word Album Reviews, 3.5 Stars, blues, Cover My Soul, Eric Sommer, guitar picking, I Caught A Cab, Rainy Day Karma, Solar Flares. Bookmark the permalink.